We’d love your help. Let us know what’s wrong with this preview of The Nones Are Alright by Kaya Oakes. To ask other readers questions about The Nones Are Alright, please sign up. Love the topic - so much work remains to be done in analyzing these recent trends. Book is mostly anecdotal with little new analysis but a helpful text fir those concerned about these trends in that is shows that a) the "nones" are often quite religious (and doing just fine!) but also b) that traditional religion would do well to recognize and adapt to this growing and evolving type of religious identity. An interesting collection of the author's interviews with many people on different parts of the faith journey. We shouldn't assume people who don't formally practice religion are godless. On the contrary, many non-practioners are seeking and thirsty, but want more or expect better, and are actually very eloquent about what they yearn for, and what has disappointed them. Despite a savvy use of queer and LGBT, this book has nothing to say about trans people and it's unclear if any of the interviewees were a non-gay sort of queer. It's also edited by a straight woman, who's certainly trying -- but from reading the table of contents I was hoping for more. The entire latter half of the book deals with Catholicism, and while it's interesting and worthwhile I found myself wishing for the more eclectic, interspersed and varied style of the first half. It also defaults to Despite a savvy use of queer and LGBT, this book has nothing to say about trans people and it's unclear if any of the interviewees were a non-gay sort of queer. It's also edited by a straight woman, who's certainly trying -- but from reading the table of contents I was hoping for more. It also defaults to talking about "very secular culture" as an obstacle for all her interviewees, without ever engaging in what secular means or how it might be important. 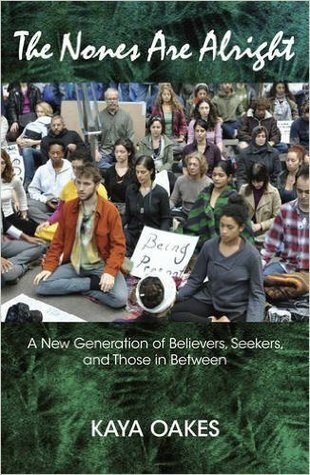 A highly readable and fascinating look into the life of the seekers and believers and doubters of the world who may find religion or faith at the fringes of or outside of institutional religion. The author does a good job of fleshing out the statistics behind those who might identify as believers but not as religious with her interviews with various people of diverse backgrounds and experiences. As someone who still finds her home in the institution of the Catholic Church but is friends with many A highly readable and fascinating look into the life of the seekers and believers and doubters of the world who may find religion or faith at the fringes of or outside of institutional religion. As someone who still finds her home in the institution of the Catholic Church but is friends with many who find faith and spirituality outside of traditional churches, mosques, temples, or synagogues, this book really spoke to the experiences of many of my loved ones. I read this for my church in controversy class, and I couldn't put it down. Such an interesting book. I highly recommend! Kaya Oakes is the author of four books, including The Nones Are Alright (Orbis Books, 2015), Radical Reinvention(Counterpoint Press, 2012), Slanted and Enchanted: The Evolution of Indie Culture (Henry Holt, 2009), and a poetry collection, Telegraph (Pavement Saw Press, 2007). She is a contributing writer to Religion Dispatches,Killing the Buddha, Commonweal, and America magazines and her essays ha Kaya Oakes is the author of four books, including The Nones Are Alright (Orbis Books, 2015), Radical Reinvention(Counterpoint Press, 2012), Slanted and Enchanted: The Evolution of Indie Culture (Henry Holt, 2009), and a poetry collection, Telegraph (Pavement Saw Press, 2007). She is a contributing writer to Religion Dispatches,Killing the Buddha, Commonweal, and America magazines and her essays have also appeared in The Guardian, Religion News Service, and Salon among others. She was formerly the co-founder and senior editor of the Utne Independent Press award-winning Kitchen Sink Magazine. Born and raised in Oakland, California, she teaches writing at the University of California, Berkeley.